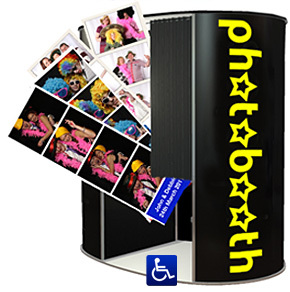 Photo Booth Hire from £199 in Huddersfield for Parties, Wedding Receptions, Proms and Events. Photo Booth Hire in Huddersfield for Wedding Receptions, Parties, Proms and Events. From our regional depots in Leeds, Manchester and Nottingham we provide photo booth hire for wedding receptions, parties, proms, Christmas parties and events in Huddersfield and throughout the UK. Recent parties include Whitcliffe Hotel, Briar Court, Pennine Manor Hotel and Bagden Hall. Yorkshire couple Stacey & John from Leeds booked a photo booth for their wedding reception at Hollins Hall Hotel, Guiseley and had a marvellous time dressing up for the picture strips. Most of the guests left video messages and they all had a great time pulling faces and posing for fun photos. With over 100 guests this was a very busy wedding reception. We plan to be exhibiting our photo booths at a number of Wedding Fairs in the next few months in order to give prospective couple a chance to experience the fun that could be generated at their wedding reception with the photo booth. We will be launching a new range of guest books for these events. Photobooth hire packages available in Huddersfield.